Heads up if you're planning to ride Metro later Tuesday night. 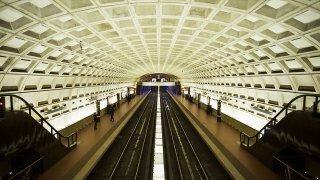 Metro service on the Blue, Orange and Silver lines will be affected by repair work Tuesday starting at 10 p.m.
Orange and Blue line trains will single-track starting at 10 p.m. between the McPherson Square and Federal Center SW stations. This will result in delays of about 28 minutes in each direction, WMATA said. Silver Line trains will run only between the Ballston and Wiehle-Reston East stations. Riders traveling to Silver Line stations in Virginia should take the Orange Line to Ballston and transfer to the Silver Line there. Similar service changes were in effect Monday night. Metro is replacing nearly 400 feet of rail through a sharp curve between the Smithsonian and Federal Center SW stations. Crews will need more time than is available during the overnight hours to work on improving safety and reliability, WMATA said. Crews also will use the time to replace more than 100 third-rail insulator and about 2,000 fasteners that hold the rails in place. Also, debris and drains will be cleaned, and any leaks will be fixed, WMATA said. Metro announced the late-night track last week, but pushed back the timing and changed the locations Monday.